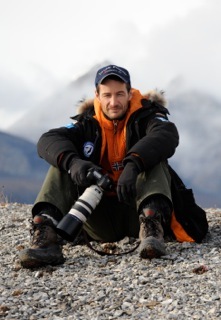 Sebastian Copeland is an award-winning photographer, filmmaker, explorer and environmental advocate. His work has been featured in international publications such as National Geographic, GQ, Vanity Fair, Men’s Journal, House & Garden, W Magazine, Elle, Cosmopolitan, People, USA Today and the New York Times. He has shot publicity and movie posters for many Hollywood studios including Disney, Paramount and Warner Bros.
Copeland has trained his camera on the planet’s magnificent landscapes, notably its ice caps. He has crossed the Arctic sea, Greenland and Antarctica in their length on skis and kites, and has reached both poles; north and south. With over 7000 kilometers under his skis, Copeland has opened new routes and earned four polar and Guinness records for his endeavors. Copeland has documented his expeditions in the form of exhibits, books, and films. His fine art images have been seen in museums and galleries worldwide. In 2007, Copeland was the recipient of the International Photography Award (IPA)’s Photographer of the Year award for his first book, Antarctica–The Global Warning. His award winning documetary Into The Cold (2011) premiered at the Tribeca Film Festival and is currently broadcast across the globe. Copeland lives in Los Angeles.